You will earn 3,804 Reward Points. Earn 1 reward point for every 1 dollar spent. Removable splashguard makes clean up easier. A terminal block is provided for field wiring connection to the main power supply. Each individual positive-off thermostat controls one-fourth of the cooking surface. 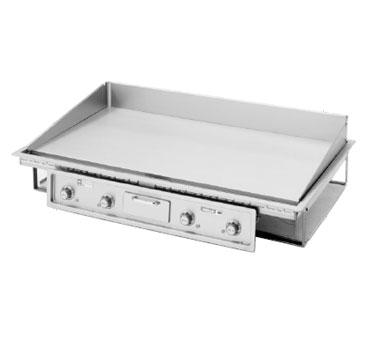 The G-246 Griddle is Underwriters Laboratories, Inc. recognized and meets NSF International standards. Enclosed tubular elements are clamped onto the 1⁄2” thick griddle plate to provide even heat distribution over the entire surface. Chrome-plated griddle surface, allows more efficient heat transfer throughout the cooking area, available by special order. Grooved griddle surface, 3/4-inch thick ribbed steel plate that allows for the “branding” of meat products, available by special order.